Gamers start becoming indeed key targets for cybercriminals: they steal their data from their game accounts and those of their virtual objects whose value may reach thousands of dollars for some of them. One of the biggest hacks of all time, of Sony’s PlayStation Network in 2011, reportedly resulted in 77 million account holder details being compromised and 12,000 credit card details being leaked. Recent trends show how attractive the gaming community has become for cybercriminals and how lucrative the game-hacking business is becoming. According to official data recently published by Steam (a multi-OS platform owned by gaming company Valve, which acts as an e-store for video games), about 77,000 Steam accounts are stolen every month. Research led by cybersecurity firm Kaspersky Lab has identified more than 1,200 specimens of the malware. Hackers go after gamers for various reasons: they can be either seeking cheats to trying to exploit the value of digital game copies and in-game items. And at the top of that chain is stealing from the games developer itself – in April 2015, one teenager in Indiana, USA pleaded guilty to being involved in a hacking ring that was said to have stolen data worth more than $100 million from one major games developer. Cybercriminals also look to make financial gain through scareware apps. In May 2015, ESET revealed the discovery of 30 scareware Minecraft apps on Google Play. Before you start playing any games, make sure that you have a security suite, i.e. firewall, antispyware software and anti-virus software. A lot of anti-virus software updates on its own, but make sure that you regularly check and update your system. A lot of gaming websites enable you to create a profile while playing their games. Don’t’ use real pictures on your profile. It is better to use an avatar, especially if you are a teen. And if you have children who regularly play games online, make sure that they are using also doing so. Taking IT courses can be a great way to enhance your internet security while playing online. You might think you already know everything but internet security about connected devices and online gaming change every day. Whenever you feel that something is inappropriate, you need to report that user or block them to stop your interactions with them. Everything from rude messages to attempts at getting your information should be considered – this is the only way the online gaming community can remain a fun and safe place everyone can enjoy. This way, you will ensure that your online activity, your p2p activities and downloads will happen safely. Learn why Le VPN is the best for online gaming. 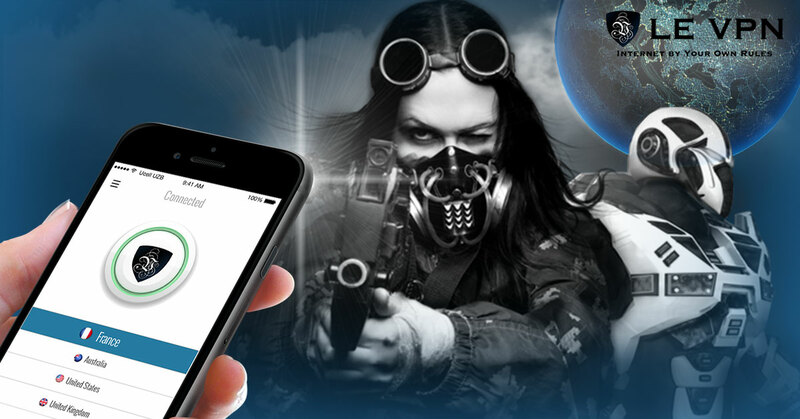 Check out how VPN keeps security: your Internet connection is encrypted with a top secret level that protects you against hackers and illegal ears trying to listen or obtain sensitive information about you. In addition, your IP address is automatically replaced by an anonymous IP address in the country you have selected. Finally, your computer is hidden behind the many VPN servers: when you are connected to Le VPN, no one can access your computer without passing through the protected VPN servers. Le VPN installation is simple and does not take more than 2 minutes. Try it now!